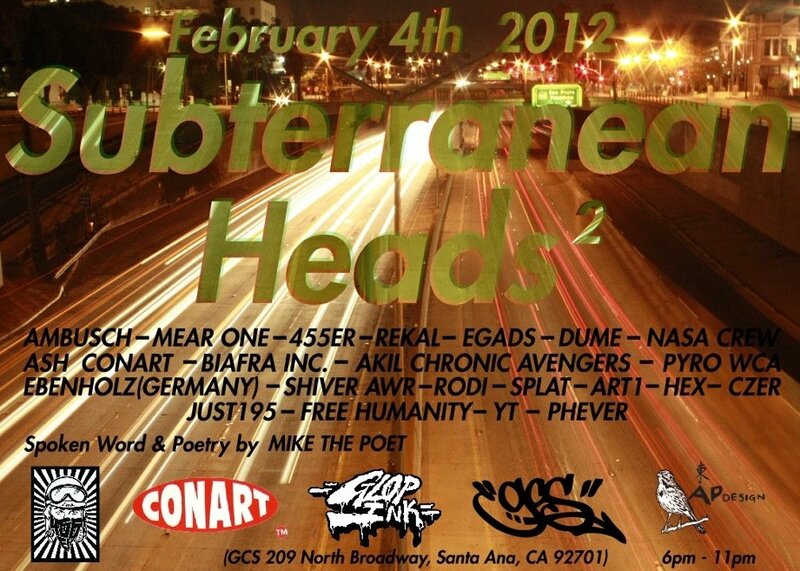 GCS and 455er is once again proud to present “Subterranean Heads 2”. An art show that explores graffitti and street art and the subterranean entities that work everyday on filling that underground space. 1st Saturday art walk always brings out droves of art lovers and with a roster that includes some of the most subterranean of heads, no one should miss this show. The first Subterranean Heads show back in August 2011 was a great success and this one should hit as well. There will also be a spoken word performance by Mike the Poet. Here is an article that describes him if you don’t know him yet. Jan.16th 2010 brought us our first b boy event. “Got Skillz” was a one on one b-boy and pop lock battle held with the cooperation of Funnybonez / Soul 2 Soul crew. Special thanks to Burst Rock, DJ Caveman, and all who came out and participated. On a side note, this is where we need your help. Hit us up with names of those participants so we can include you on the historical roaster (Elton, co-b-boy champ, what’s your stage name?). Overall, a great start to an event that will be with us as long as we are here in Santa Ana!